Admittedly, buying our house has limited our travel of late, but it certainly hasn’t squelched our adventures both grand and not-so-grand! One of the things we’ve been excited about lately is prepping our flower beds for the warm summer ahead. We’ve been carefully trimming back the Northwest native plants while laying slaughter to the invaders – one after another they meet their match — the uncompromising bulb smasher Maylene. This has left us with a lot of empty beds and grand plans for restructuring the yard that won’t take shape for some time. 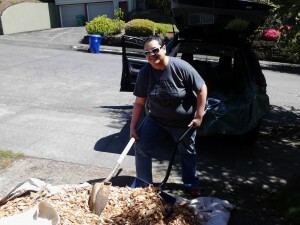 In the PNW, we call that time for mulch! As small business owners, we recognize we have ultimate control over our schedule. That’s why today, when the first item that popped up on Craigslist in the FREE section when Maylene checked at noon was for cedar wood chips — we jumped at the chance to grab them, knowing we had to scoop all the other Craigslist lurkers or our booty would be gone! 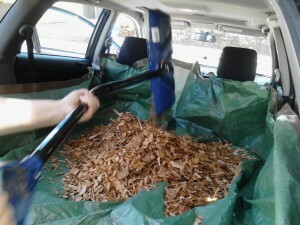 Throwing on a “play” shirt, old jeans, and slippers for good measure, we jumped in the car and headed as fast as we could to Inner NE to scoop the pile of wood chips – giving only secondary consideration as to how we would get it home — the most important thought was to get there first! Pulling up to the address we were so excited to find that our mid-day adventure had paid off with at least a yard worth of beautiful, free wood chips. That’s when we realized there was no other way to get the chips home than in the back of our Pontiac Vibe, Vivianne. Don’t get me wrong, she is an amazing little car and she’s held a lot of things over the few years we’ve had her, but I just hadn’t seen filling her like a dump truck as an option. Vivianne, our Vibe was named after an inspirational friend — a solo world traveler, Vivianne was the perfect name for our Vibe. And we’ve grown to quickly love her – both the namesake and the car (fully folding back seats are now a requirement). Endearingly known as our mini-SUV or best pick-up truck ever, we move everything in Vivianne. Recent accomplishments include a loveseat and on a separate trip requiring off-road galavanting through the forest down dead-end gravel roads on the hunt for a 60 year-old beauty — a full-on chest of drawers and matching nightstand. 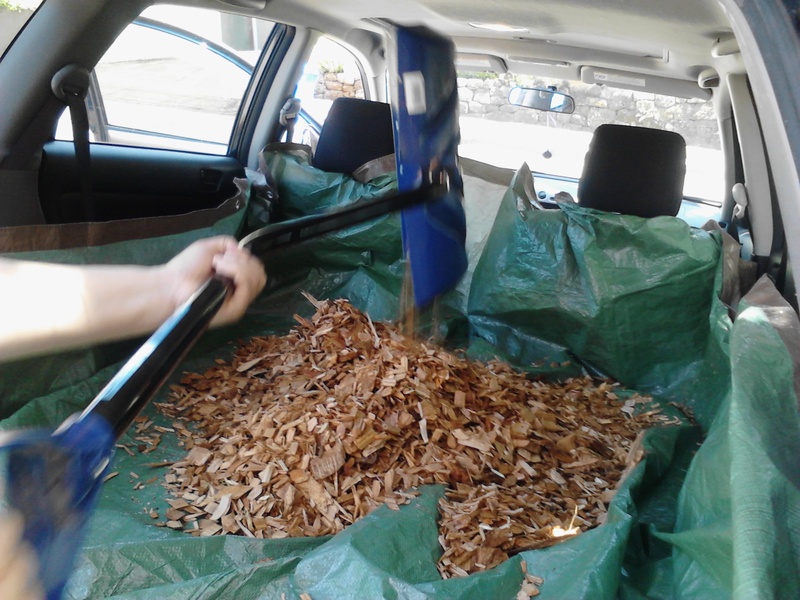 But none of those adventures could out-do the beauty of a car-load full of wood chips. Seeing them being shoveled in by an as-yet unused snow shovel made me giggle. So I’ve decided we must document all of the marvelous wonders we find on Craigslist and shuttle home in our best-little-car-ever, Vivianne! 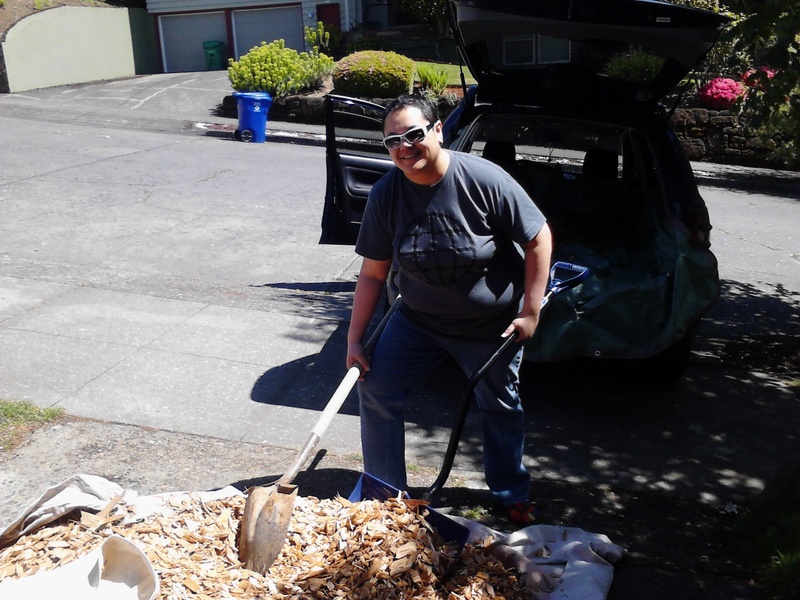 Just in case you’re wondering, we did manage to get all the chips in the car and home safely – unloaded and placed throughout several cleared beds – ’cause Vivianne’s awesome! Now that we’ve been in Portland for three years and bought a house (! ), it’s obvious we’re pretty serious about this town. When friends and family ask about our newly-adopted city, we gush about its people, culture, and vibe. Now that we’re getting more visitors through AirBnB, we thought we’d put together a list of stuff we like here with links to the place/business or our Tripadvisor/Yelp reviews, when available. This is by no means comprehensive. We’re still discovering new spots all the time and will update the list when we can, so check back for updates. We have an awesome public transportation system. In fact, it was a huge factor in our moving here in the first place. Why not take the bus or light rail? An all day pass is just $5. Kale – Do you like curry? Have you had Japanese curry? Either way, if it’s not Sunday, you need to go here. Hands down, my favorite curry anywhere. #Tip: try the Original Doria and thank us later. Bread & Ink Cafe – The best ketchup in the world, I think it’s made with love or something. And ridonkulous Chicken ‘n Waffles, probably because the waffle is from the Waffle Window next door. Voodoo Donuts – The almost obligatory gut bomb when visiting the city. My favorite: the gay bar. Do yourself a favor and skip the downtown location if there’s a line around the corner and go across the river to Voodoo Too. Usually has a much shorter line and the same donuts. Just saying. Sesame Donuts – If you’re ever in Tigard and the Beaverton area, Sesame Donuts has really much better donuts than its more infamous pagan competition. Family-run and reasonably-priced, you won’t find pastries with shock value but usually perfectly made Goodness – lightly crispy outside, soft chewy inside. Burgerville – Sustainable fast food with a local focus. If you must have a burger quickly, this is a good place to get it done. The Timber Joey Smoothie tastes just as good as a regular shake with 0 fat and a fraction of the calories. And the sauce in the original burgers reminds me of Byrons back home in Hawai`i. Miho – Japanese bar food with a twist. Affordable, tasty small plates of food, including a vegan spam musubi. Whaaa??? Taqueria Portland – Some of the best Mexican food I’ve found anywhere in town. East Side Deli – The sandwich place we can both agree on, satisfying both vegetarians and meat eaters alike with its HUGE sandwiches. Southern Belles – Our favorite food cart in North Portlands serves the yummiest burgers and sandwiches. There are so many cool, funky places to have a drink, you really can’t go wrong. Try random places around town for variety, or go to your favorite neighborhood and just pick a bar. Distilleries, microbreweries, wineries — this town has it all. The Green Dragon – If you’re into beer, chances are, you’ll find something to love at this laid back pub. Plews Brews – When visiting St. Johns, be sure to stop in and have a beer at Plews Brews. The drinks are cheap and yummy, Bob Marley posters adorn the wall, and interesting characters are often afoot. Ground Kontrol – Old school arcade that is 21 and over after 5pm. So that they can serve you drinks with your Frogger or Star Trek TNG pinball, complete with drink holders on the side of the machine. For $5 on Wednesday, play all you like for free. Wunderland – I didn’t know this was a chain. I’ve only been to the Avalon location and had a lot of fun playing ridiculous ticket games (Skeeeeeeee!) for cheap plastic crap. Timbers – If you can score tickets, this is an absolutely fabulous time to spend with friends or family. #Tip, take the Max to the park, if you can; if you insist on driving, park at the Smart Park at 10th and Yamhill and walk to the park. Really. Trust us. OMSI – the Oregon Museum of Science and Industry always has something fun and interesting going on whether in the exhibition area or at the Imax. Go geek out! Drive Old Hwy 30, Waterfalls route – Best on a warm spring or summer day. Drive the old highway and hike the waterfalls along the way. Magnificent. St John’s Cinema – Inexpensive first-run movies + cheap food + optional alcoholic beverages = an awesome movie experience. Oh yeah, and I heard there’s a ghost. Powell’s Books – One of the greatest book stores ever. Go get lost. ‘Nuff said. Washington Park – This place is huge and encompasses the Oregon Zoo, Japanese Garden, Hoyt Arboretum, and miles of trails through nature. Portlanders, what did I miss? Admittedly, I don’t get out much, so if I’m missing your favorite haunt, post a comment below. Since we moved out of the hustle and bustle of downtown to the ‘burbs of Portland and squarely into the quirky neighborhood known as St. Johns – named for a hermit who first settled the Peninsula. It is said that he was a quiet, saintly man — and also that he didn’t frequent the local brothel — earning him the nickname Saint John. 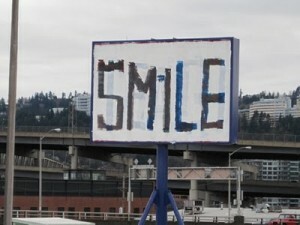 One of the mottos that any visitor or newcomer to Portland hears over and over is “Keep Portland Weird”. 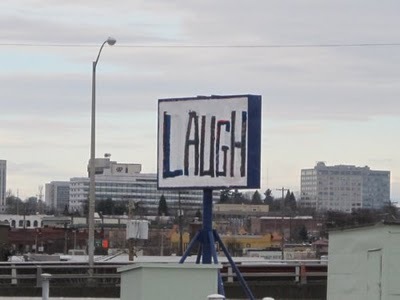 Portlanders are very proud of their city’s reputation for eccentricity and declare the statement broadly on entire building walls. This propensity for odd behavior manifests itself in the behavior of its citizens. It’s like we have all decided to flow through life listening to our own beat and expect you to do the same. There’s just something about this town that’s so wrong in all the right ways. Never fear Portland — you are in no danger of losing your bell-ringing weird status! The funny thing is that if Portland is weird — St. Johns has to be the bacon dripped salaciously over the majestic maple delight donut of weird. Thank you Voodoo. You see — St. Johns has just a little something something — extra-especially weird. It’s hard to describe. An odd blending of old, new, down-on-your-luck, newly made middle class, and re-gentrification mish-mashed together and centered around a downtown core of tiny Mom and Pops and ubiquitous dive bars. Just like a nice breakfast blend on a foggy morning, all the flavors of St. Johns come together nicely — creating a sum total greater (and weirder) than each individual. 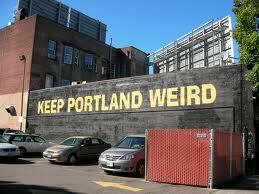 So I guess the St. Johns’ rallying cry should be “Keep St. Johns Weird-er”! Our favorite Burlingame political activist has been at it again with eye-catching commentary on life in these United States. 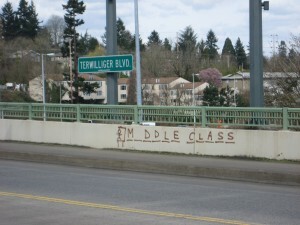 Strategically placed exactly opposite a popular freeway exit in Portland’s high-priced West Hills neighborhood, this graffiti takes direct aim at the squeezing of the middle class in America. While Portland has its fair share of random, non-sensical let-me-mark-my-territory-arr-arr-arr graffiti, it also has a wide variety of thoughtful street art too. In the Burlingame neighborhood of Portland recently, it seems one artist has been trying to force commuters to think critically about the world around them. The first bit of brown spray paint that caught our eye was on a concrete retaining wall just off of Barbur Blvd in bold 12″ letters. 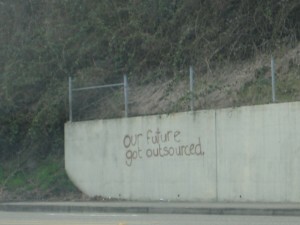 I like the way the artist ended the statement. With a period. Definitive. The statement just IS — there is no sense in arguing. Period.